The Bharatiya Janata Party (BJP) released their second list for elections to the 224-member Karnataka Assembly comprising of 82 candidates on Monday. After releasing the first list of 72 candidates, the second list was finalised by the party's Central Election Committee which is chaired by party president Amit Shah. BJP will be looking to turn things around in the upcoming Karnataka Elections that will be held on May 12 this year in all 224 constituencies of the state Legislative Assembly. The saffron party will have BS Yeddyurappa as their chief ministerial candidate for the upcoming elections. On Monday, Bharatiya Janata Party (BJP) released their second list for elections to the 224-member Karnataka Assembly comprising of 82 candidates. After releasing the first list of 72 candidates, the second list was finalised by the party’s Central Election Committee which is chaired by party president Amit Shah. Along with the party president, the Central Election Committee has upper echelons of the party including the likes of Prime Minister Narendra Modi, Home Minister Rajnath Singh, Finance Minister Arun Jaitley, External Affairs Minister Sushma Swaraj and Health Minister Jagat Prakash Nadda as its core members. BJP’s central election committee finalised the second list in the national capital yesterday. Earlier the party had revealed the first list of 72 candidates for the crucial Karnataka Assembly elections on April 8. 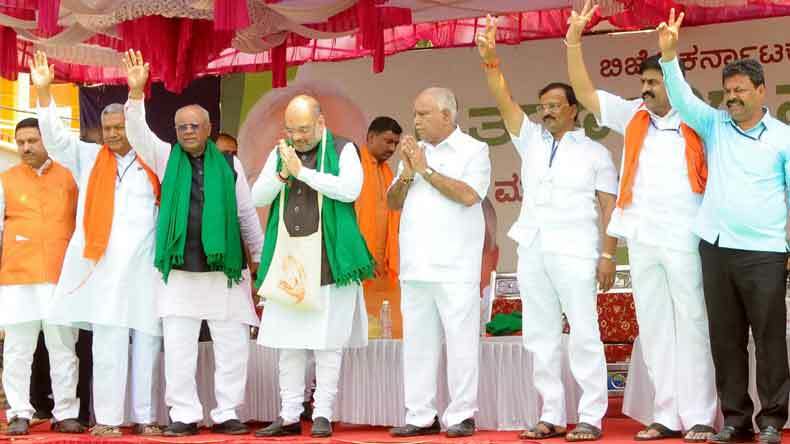 Eager to return back to power after five years absence, BJP will be looking to turn things around in the upcoming Karnataka Elections that will be held on May 12 this year in all 224 constituencies of the state Legislative Assembly. Aiming to win 150 out of 224 assembly seats, BJP are hoping to return to power in the state of Karnataka under senior leaders BS Yeddyurappa, KS Eshwarappa and Jagadish Shettar. The saffron party will have BS Yeddyurappa as their chief ministerial candidate for the upcoming elections. “Here is the second list of 82 BJP candidates for the upcoming assembly elections. We wish candidates the very best!,” the party tweeted from their official handle on Monday. While the two opposition parties —Bharatiya Janata Party and Janta Dal (S) along with their allies will fight for supremacy against the ruling Congress, Arvind Kejriwal led Aam Aadmi Party will make their debut in the state of Karnataka.